(Nanowerk News) Studies have estimated that each year between 4 and 12 million tonnes of plastics end up in the sea, and that the figure is expected to double over the next ten years. But we have only begun to learn what happens with the plastics afterwards. Two students on the MSc programme Aquatic Science and Technologyhave now developed a method that can measure the microplastics that other methods overlook. Using a filtration system mounted on the stern tube water intake of the marine research vessel Dana, the two students Robin Lenz and Kristina Enders collected microplastics on a route from northern Denmark across the Atlantic to the Sargasso Sea and back again. This enabled researchers from DTU Aqua to determine the volume of plastics in the sea. “There's a lot of focus on plastics in the sea just now, but there are still many unknowns. Therefore, there is a great need to develop new methods to examine the extent of the problem and understand what actually happens with the plastics that end up in the sea. For although plastics are everywhere, we do not find them in the quantities to be expected based on the the large quantities that every year is led out into sea, and the big question is what becomes of it?” asks the professor. Dana’s expedition passed through very different marine areas—from coastal zones across the open ocean to the famous vortices (gyres) in the Sargasso Sea. The highest concentrations of microplastics were found close to the coasts, i.e. in the English Channel and at the Azores as well as in the vortices in the Sargasso Sea, says research assistant Kristina Enders, DTU Aqua: “Despite sailing through the large areas with vortices, the so-called ‘gyres’, we found that macro- as well as microplastics accumulate here, and large pieces of plastic were floating by every other minute, but it is wrong to refer to them as ‘plastic islands’. On the other hand, we found microplastics in all samples—from 13 to 501 pieces per cubic metre of water, i.e. up to 1 particle for every 2 litres of water. And there was a majority of the smallest plastic particles and fibres." While the traditional nets for examining volumes of plastics in the sea typically collects plastics larger than 300 µm on the surface, the team from DTU has developed a method which can collect microplastics down to a depth of five metres while the ship is sailing. In this case, plastics down to 10-100 µm, i.e. up to one and a half times the thickness of a human hair. "We found microplastics everywhere along the almost 10,000 km long route. "Professor Torkel Gissel Nielsen, DTU Aqua “There are fundamental differences between how small and large microplastics are distributed in the sea. Our calculations show that the smaller the microplastics, the more they are distributed—also down through the water, so that the larger pieces are on the surface and the smaller pieces are found at greater depths," explains Kristina Enders. Half of the microplastic particles and fibres were of the types that are lighter than water (polyethylene and polypropylene) and therefore remained on the surface for a longer period of time. In general, there is a need to develop appropriate methods, also when it comes to assessing what is, in fact, plastics in the samples collected. 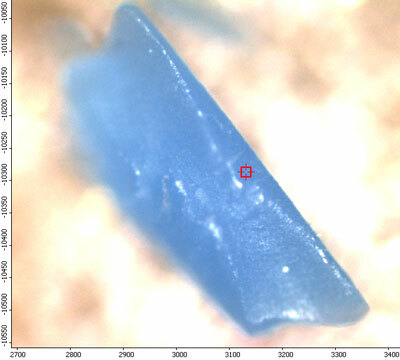 In this connection, the group tested the common method of counting the pieces of plastics under a microscope to subsequently verify, using Raman spectroscopy in collaboration with DTU Nanotech, whether it in reality was plastics that had been found. All in all, the research team did not find plastics in the magnitudes they would have expected in their examinations. But are plastics in the sea even a problem? “The problem is that we know that there will be more, but we do not know what happens with it. We humans impact the sea. We find plastics everywhere—in everything from copepods to fish—but we do not know what they do and how they affect marine life and ecosystems. And once they has entered the sea as microplastics, there is nothing we can do to remove them again. So, if they in twenty years turns out to be a problem, we are stuck with them until nature removes them,” says Professor Torkel Gissel Nielsen. "Abundance, size and polymer composition of marine microplastics >- 10 µm in the Atlantic Ocean and their modelled vertical distribution"
"A critical assessment of visual identification of marine microplastic using Raman spectroscopy for analysis improvement"